Bullying is unwanted, aggressive behavior among school aged children that involves a real or perceived power imbalance. The behavior is repeated, or has the potential to be repeated, over time. Both kids who are bullied and who bully others may have serious lasting problems. 6 out of 10 Kansas City teens say they witness bullying in school every day. It’s time to stop bullying by helping kids, teens and adults to call it when they see it. In soccer, the red card indicates a serious offense, and the player is removed from the game. Project Red Card aims to take bullying out of play and encourage kids to speak up against bullying. In 2016, Children’s Mercy and Sporting Kansas City began a ground-breaking, long-term partnership. Together, these two prominent Kansas City organizations are working to create positive change in the health and well-being of our community. Bullying has become an increasingly prevalent problem in Kansas City. Both kids who are bullied and kids who bully others can have long-term mental and physical health concerns. 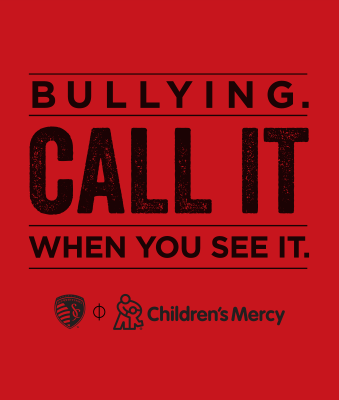 Children’s Mercy and Sporting KC are teaming up to help kids, teens and adults speak up against bullying. If you need help, please visit StopBullying.gov or call the National Suicide Prevention Hotline at (800) 273-TALK (8255). © 2018 Sporting Kansas City and Children's Mercy. All Rights Reserved.